See our "available puppies" page for more information on future litters. Ashley's Aussies is a hobby breeder of Toy, Miniature and Standard Aussies in the Columbia Gorge region of Washington State. I currently have 2 producing females and 2 males in our breeding program and several retired adults who have produced many puppies over the last 9 years and are enjoying their retirement. Since I acquired my first toy male, Action Jackson, from Amy Burris at Windy Plain Acres in Nebraska in 2008, I was hooked and have been breeding Aussie puppies since. We breed for health and temperament while conforming to the breed standard and strive to produce happy and healthy puppies to place into their new, forever homes. My adults are registered with either the AKC or ASDR (or both!) and have been health tested for OFA, CERF and MDR1. Remember when you pay for one of my puppies, you've also paid for the time, care, feeding, supplies and health testing that goes in to all of our adults and their litters. I spend countless hours with my adults and each litter, handling them from birth and giving them each names to teach them that they are individuals (and to have some manners!). It is not unusual for my son and I to climb into their puppy pen and let them crawl, lay down and even fall asleep all over us. Every one of our puppies is special and never forgotten. If I could, I would try to keep them all! I entrust you with a canine life that will love you, trust you and depend on you for all of their needs. I am always here as a resource to my puppy buyers and hope to stay involved in each puppy's life as they grow older with their forever, loving families. Thank you for visiting Ashley's Aussies website!! We are a NuVet Kennel!! "Ashley's Aussies" for more up-to-date information, videos & pictures! I would not talk baby talk: 'Eat your din-din'. 'Yummy, yummy for the tummy'. My house would not look like a daycare center, with toys everywhere. I would not have as many leaves (or pine needles) INSIDE my house as outside. I would not have to answer the question 'Why do you have so many animals' from people who will never have the joy in their lives of knowing they are loved unconditionally by something as close to an angel as they will ever get. 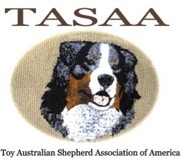 An Australian Shepherd Shares my life - A beauty of a breed. A dog that's blessed with cunning, intelligence and speed. The Shepherd is devoted, a protector to the end. I can't imagine life without my shepherd, my best friend. From time to time people tell me, "Lighten up; it's just a dog," or, "That's a lot of money for just a dog." They don't understand the distance traveled, time spent, or costs involved for "Just a dog." Some of my proudest moments have come about with "Just a dog." Many hours have passed with my only company being "Just a dog," and not once have I felt slighted. Some of my saddest moments were brought about by "Just a dog." In those days of darkness, the gentle touch of "Just a dog" provided comfort and purpose to overcome the day. If you, too, think its "Just a dog," you will probably understand phrases like "Just a friend," "Just a sunrise," or "Just a promise." "Just a dog" brings out the compassion and patience that makes me a better person. Because of "Just a dog" I will rise early, take long walks and look longingly to the future. For me and folks like me, it's not "Just a dog." It's an embodiment of all the hopes and dreams of the future, the fond memories of the past, and the pure joy of the moment. "Just a dog" brings out what's good in me and diverts my thoughts away from myself and the worries of the day. I hope that someday people can understand it's not "Just a dog." It's the thing that gives me humanity and keeps me from being "Just a man or woman." So the next time you hear the phrase "Just a dog," smile, because they "Just don't understand." Copyright 2015 Ashley's Aussies. All rights reserved.